Today’s modern Royal Air Force (RAF) is the UK’s aerial, peacekeeping and fighting force. It’s made up of impressive full-time Regulars and spare-time Reserves who come from diverse backgrounds and work side-by-side to make a difference at home and abroad. 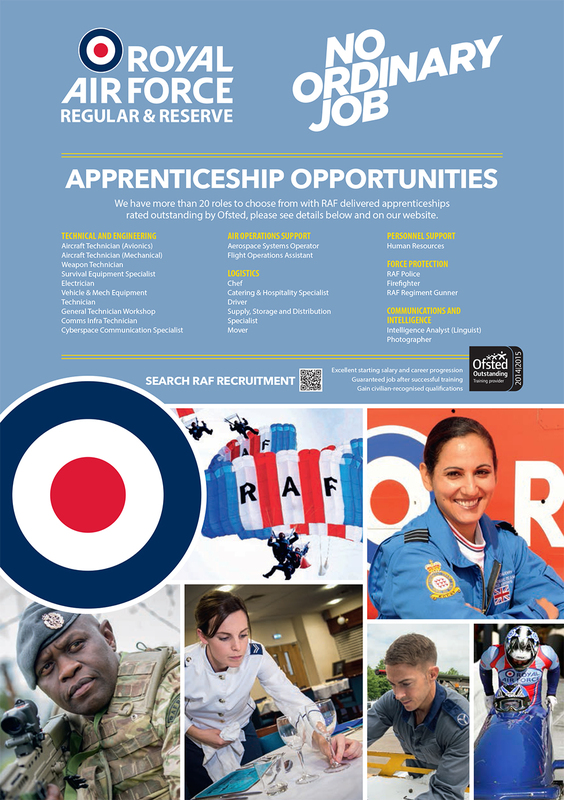 When it comes to recruitment their focus is attracting the best personnel, and ensuring they’re well taken care of during and after their service in the RAF. Their primary role at home is to defend UK airspace. They do this through reconnaissance, intelligence gathering, surveillance, and cutting-edge technology that enables rapid responses. Equally important is the work they do in communities across the UK and beyond. They’re actively involved in raising money for a range of charities, hosting youth leadership courses, getting their hands dirty to protect the environment, helping sea turtles threatened with extinction, and taking part in community projects. This is in addition to the world-famous aerobatics displays and ceremonial events that form an integral part of life in the RAF. They may be a fighting force that provides flexible and specialised air power, but their role abroad includes more than that. In trouble spots around the globe, they help police the skies and support peacekeeping and reconstruction initiatives. They do this through temporary deployments overseas and permanent commitments like their base in the Falkland Islands where Eurofighter Typhoons, Sea King helicopters, a Hercules transport aircraft and RAF personnel are based to maintain stability in the region. It’s not always about their interests though. They provide humanitarian aid to victims of war and natural disasters, deliver life-saving shelters and food supplies, and even airlift people to safety. The RAF personnel have worked tirelessly in disaster zones like the tsunami in Indonesia and earthquake in Pakistan. Whether they’re preventing a civil war, providing relief and aid to countries that need it most or thwarting terrorist actions, being a force for good is what their work is really about.